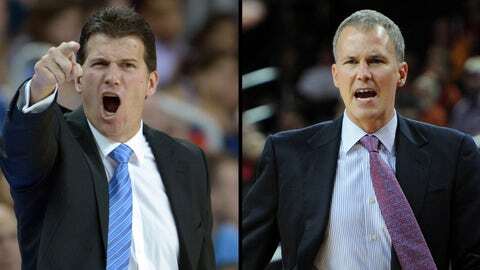 The Crosstown Showdown between Steve Alford's (left) Bruins and Andy Enfield's (right) Trojans will kick off Pac-12 play, Sunday at Pauley Pavilion. It was a relatively slow week in college basketball and the landscape in Southern California didn’t see any drastic changes. San Diego State continues to be by far the best team, while the Bruins are still struggling to close out games. However, it’s the final week before conference play starts in both the Big West and the Pac-12 and a few final tune-up games may prove key in developing some momentum. Here’s all the action from the last week of area college hoops. During last week’s Steve Alford teleconference the UCLA head coach spoke of wanting his team to develop a tougher defensive identity. The Bruins took a step in that direction Saturday night when they held off Alabama in the second half at Pauley Pavilion. However, there was one player the Bruins couldn’t seem to contain no matter what screens were in place and that was Alabama guard Trevor Releford. Releford scored 34 points and hit 11 from the field and tied the game at 67-all with only 1:34 left to play. But UCLA did something it hasn’t done well all season: rebound down the final stretch and key free throws proved to be the difference-maker. "(I told the team) that we needed this," Alford said. "We were tied with Duke at half, we were up at Missouri, so we haven’t been in that situation, especially at home, and we needed somebody to give us a really good shot at home." Andy Enfield and his Trojans have played a relatively easy schedule during non-conference play and they ended it with a win over Howard, Sunday at the Galen Center. The good news: J.T. Terrell is back and picked right up where he left off, scoring 24 points over his last two games and Byron Wesley has been unstoppable with lines of 26 points/10 rebounds and 20 points/eight rebounds in his last two games. The bad news: The easy games are over as Pac-12 play begins next Sunday. It’s going to be a grind from here on out for USC. The Trojans win 9 non-conference games for the 6th time in the last 24 years. Long Beach State won its third straight and its first road game of the season with a big overtime win at Nevada. Junior point guard Mike Caffey pulled through with the heroics once again with a buzzer-beater at the end of regulation and it’s clear that the addition of Tyler Lamb has helped ease the pressure off of Caffey. Caffey scored 26 points and dished out five assists, while Lamb scored 17. But Caffey was free to run the offense as he pleased instead of trying to be the entire offense and the team chemistry is evident. Hawaii went 2-1 in the Diamond Head Classic over the week and although it was somewhat of a down year for the event, the field did pose challenges for the Warriors. But Brandon Spearman met those challenges head on, shooting over 50 percent from the field and behind the arc, helping Hawaii to wins over Oregon State and St. Mary’s. For his efforts, he was named to the all-tournament team. The Crosstown Showdown will kick off Pac-12 play, Sunday at Pauley Pavilion. The game will be broadcast nationally on FOX Sports 1 and, most importantly, it will be the first time Enfield will face UCLA since making comments about the Bruins being "slow" before the season started. Expect an excited and hostile crowd in Westwood.